The winter season brings about a new world of possibilities when it comes to taking photos. Everything suddenly becomes blanketed with fluffy white snow and sparkling ice, creating a stunning landscape. 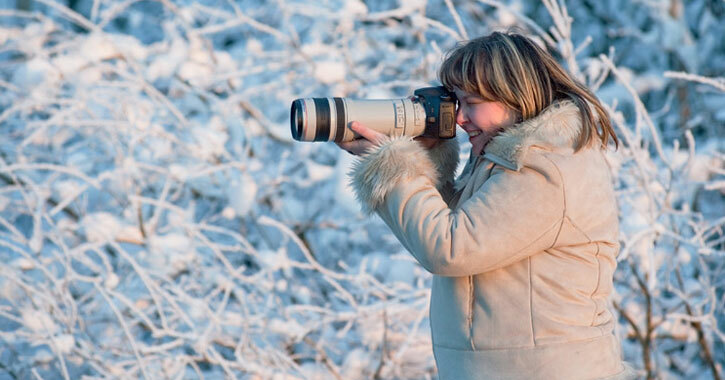 It can be tempting to rush out and start taking photos, but if you're an amateur photographer, there are a few winter photography tips you'll want to know to keep your equipment safe and your photos brilliant. Below we've summarized some of the most important winter photography tips that will help you this snowy season. Days are shorter during the winter season, so you'll want to be aware of both the time of day and the weather before you head outdoors with your camera. The "golden hour," also known as the first and last hours of the day (after sunrise and before sunset), tends to provide the best light for photos. However, you don't want to find yourself in the middle of the woods when the sun is setting quickly in winter. In addition, the winter season means winter storms, so gray clouds will become much more common in your landscape photos. Try planning your photography trip around a sunny day, or wait until a snowstorm has passed and snap some shots of the aftermath. You'll want to keep your camera in pristine condition when outside in cold temperatures. Many batteries may not perform to the best of their ability in the cold, and you may find that your camera is not snapping photos as quickly as you'd like. To keep your batteries fresh and your camera fast, consider purchasing a special external battery pack, which you can keep warm in your pocket and connect to your camera with a long cord. A winter landscape photo really shows how an area can transform into a winter wonderland, but that's not the only type of photo you should take this season. Try zooming in on an object or piece of scenery that stands out to you. For example, a window covered in ice or a row of hanging icicles may be more visually striking than another wide shot. Although winter photos can be beautiful, you also don't want a whole album full of bright, white images. One way to add some variety to your photographs is to include a contrasting element. If you're taking photos of people outdoors, have them wear a piece of clothing with color, such as a red scarf, to liven up a winter photograph. A winter landscape may look pretty to the naked eye, but all that brilliant white snow can confuse your camera's internal metering system. All cameras have a built-in metering system, designed to balance colors in a scene and deliver a perfect picture. The metering system works best when photographing a scene with a wide tonal range, including all colors and hues. But when you're looking to photograph a scene that is mostly white, such as a winter landscape, the camera typically underexposes the scene so that the beautiful white snow you see looks gray in your picture. Thankfully, there's an easy fix. Just select the "snow scene mode" that comes with your camera. Advanced users can manually set the exposure compensation settings to make the scene brighter and whiter.